I’ve heard that the appearance of ghosts is often caused by untimely or violent deaths. If that’s true, then Charleston is likely a hotbed for war ghosts. Charleston has seen its share of war. From the American Revolution to the Civil War, the city is chock full of the ghosts of war. Construction began on Fort Sumter in 1827. Named for Revolutionary War hero, Thomas Sumter (a.k.a. the Gamecock), this Third System, five-sided fort still sits on a sandbar at the entrance to the Charleston Harbor. It was a serious stronghold in the harbor, with walls five feet thick and 50 feet high. The fort was still unfinished at the end of 1860, when Major Robert Anderson commanded the United States Army forces in South Carolina. Anderson, along with 127 men, were initially stationed at Fort Moultrie, on Sullivan’s Island. But Anderson deemed Fort Moultrie too large to be adequately defensible. It required a garrison of at least 300 men. So, on Christmas night, 1860, Anderson began readying his men for the evacuation to Fort Sumter. By the next day, he’d loaded his men onto two schooners with all of the ammunition and provisions that could be transported. He had his staff destroy the guns and armaments remaining at Fort Moultrie, and sailed the short distance to Fort Sumter. Needless to say, the Confederacy didn’t like Anderson’s forces taking hold of Fort Sumter. Not at all. On December 30, 1860, the Charleston Courier printed an article condemning Anderson for having “achieved the unenviable distinction of opening civil war between American citizens by an act of gross breach of faith.” The article was reprinted by the New York Times on December 31, 1860. 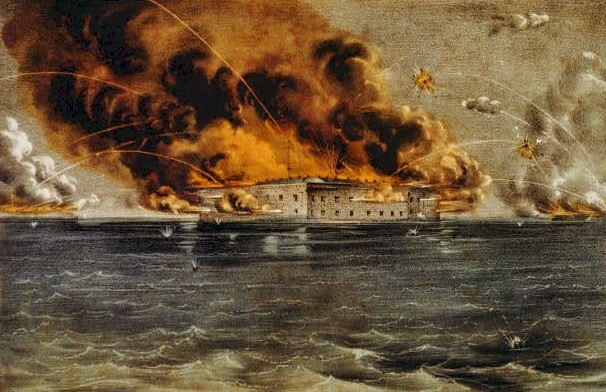 I am ordered by the government of the Confederate States to demand the evacuation of Fort Sumter. My aides, Colonel Chestnut and Captain Lee, are authorized to make such demand of you. All proper facilities will be afforded for the removal of yourself and command, together with company arms and property, and all private property, to any post in the United States which you may select. The flag which you have upheld so long and with so much fortitude, under the most trying circumstances, may be saluted by you on taking it down. Colonel Chestnut and Captain Lee will, for a reasonable time, await your answer. At 3:20 a.m. on April 12, Gen. Beauregard sent word to Maj. Anderson that the Confederacy would begin to open fire on Fort Sumter…in one hour. True to his word, Beauregard ordered his forces to fire on Fort Sumter at 4:30 a.m., the first shots of the War Between the States. 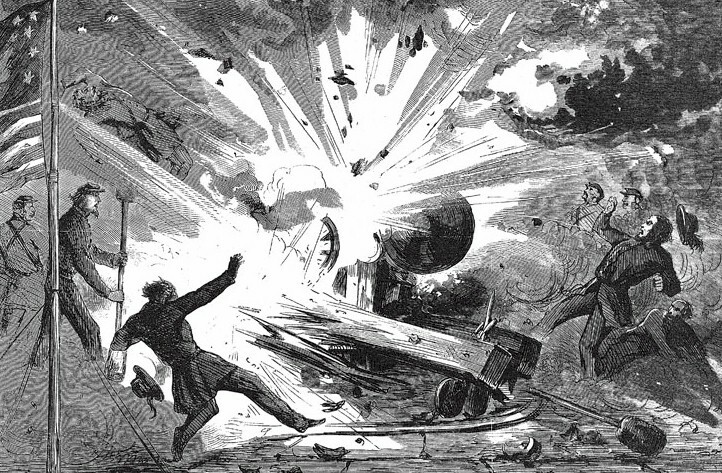 Beauregard’s forces pummeled Fort Sumter, raining hell-fire down on Anderson’s men. Charlestonians sipped cocktails while hooting and hollering from their balconies, cheering the Confederacy. Anderson’s forces did return fire, but they were simply out-gunned and running low on ammunition. 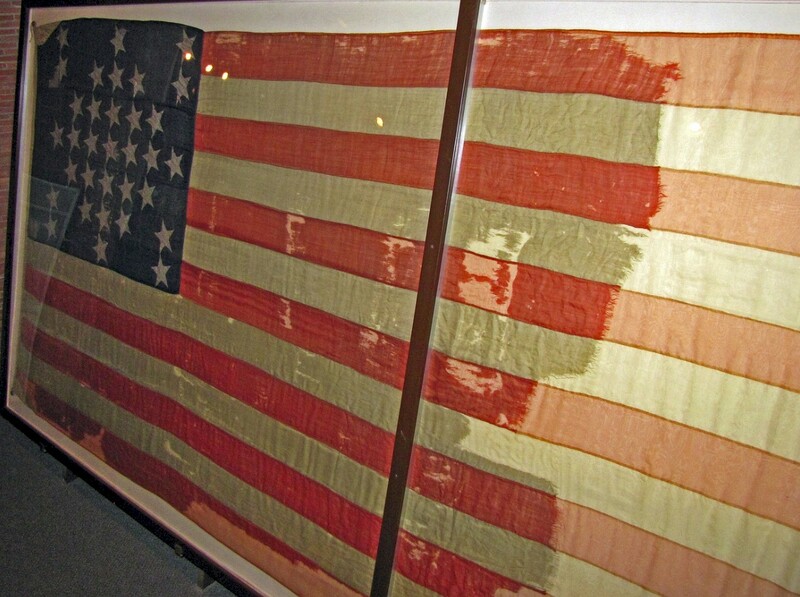 The U.S. flag, the Garrison Flag, was torn and had fallen during the battle. A U.S. soldier, Sgt. 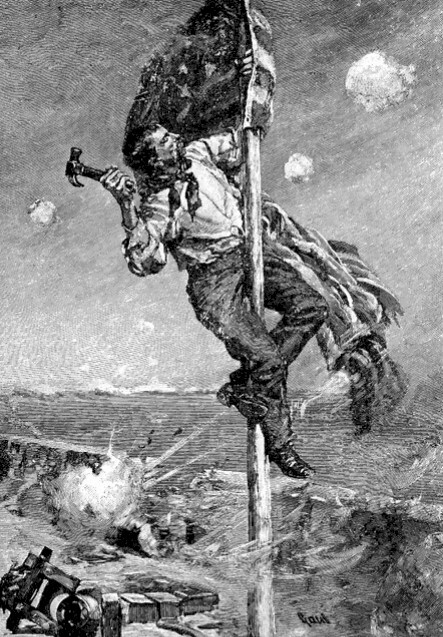 Peter Hart, bravely hung the much smaller Storm Flag in its place…symbolic, perhaps, of Anderson’s waning resolve to stay vigilant under the threat of total annihilation. But miraculously, despite 34 hours of near-constant shelling, the only casualty was a Confederate horse. Beauregard again asked Anderson to surrender. 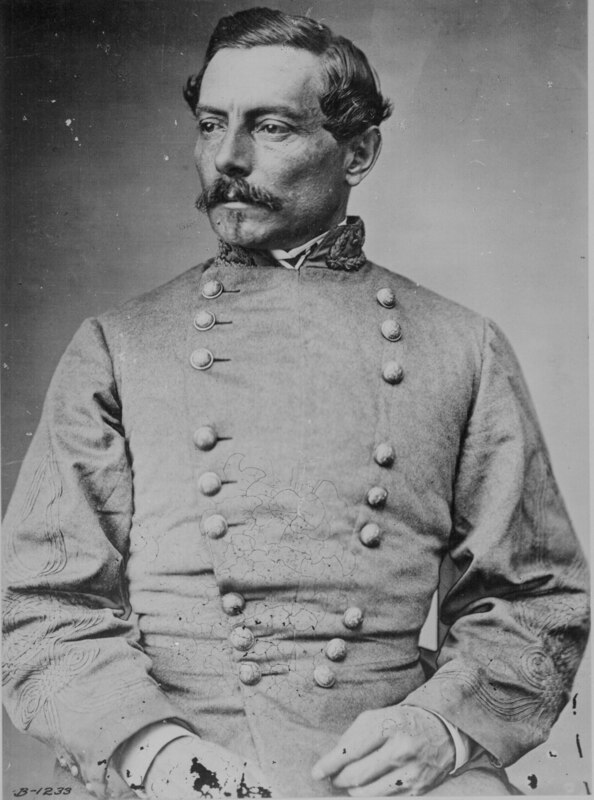 This time, Anderson complied, provided Beauregard’s offer to allow an honorable surrender was still valid. It was. Enter Pvt. Daniel Hough. Hough was born in Tipperary, Ireland, and emigrated to the United States sometime in the 1840s. He was a Regular, not militia, despite the fact that pre-Civil War soldiering was not a glamorous job. He enlisted in 1859, then re-enlisted in January of 1861, and was assigned to Battery E of the 1st United States Artillery Regiment, and stationed at Fort Sumter. Pvt. Hough was assigned to gun #47 for Anderson’s honorable surrender–a 100-gun salute to the U.S. Flag on April 14, 1861. It’s unclear whether a hot ember ignited a pile of cartridges, or if his gun prematurely sparked. What is known is that when Pvt. Hough tamped down the gun, it exploded, killing him almost instantly, mortally wounding Edward Galloway, and injuring four others. Anderson’s salute was cut short to 50 guns, and Pvt. Hough was buried on the parade grounds. 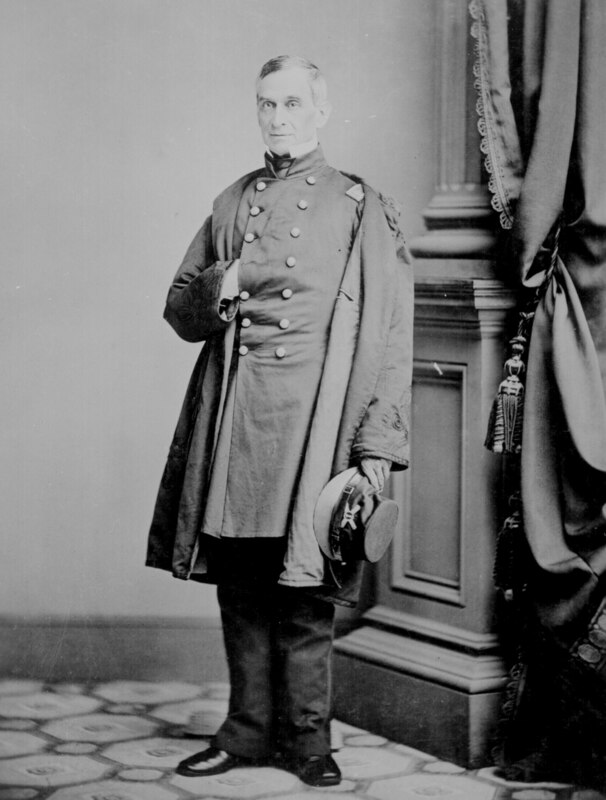 His remains were relocated–some say to Magnolia Cemetery, some say to New York–but Hough’s legacy was forever cemented as the first human casualty of the Civil War. Today, visitors to Fort Sumter have reported seeing a source-less smoke, as if a weapon were fired. Some report having smelled gunpowder while in the fort. But every visitor to Fort Sumter can see the face in the flag. The Storm Flag, still standing when Anderson surrendered, was taken to New York with the rest of Anderson’s men. Soon after the surrender, the flag went on a national tour to drum up support for Union forces. On that tour, the flag began to fade, and a face appeared just to the right of the center star. Men who served in Battery E of the 1st U.S. Artillery Regiment had identified the face as the bearded Daniel Hough’s, still wearing his U.S. Army cap. True? Maybe. Weird? Definitely! Check it out for yourself. 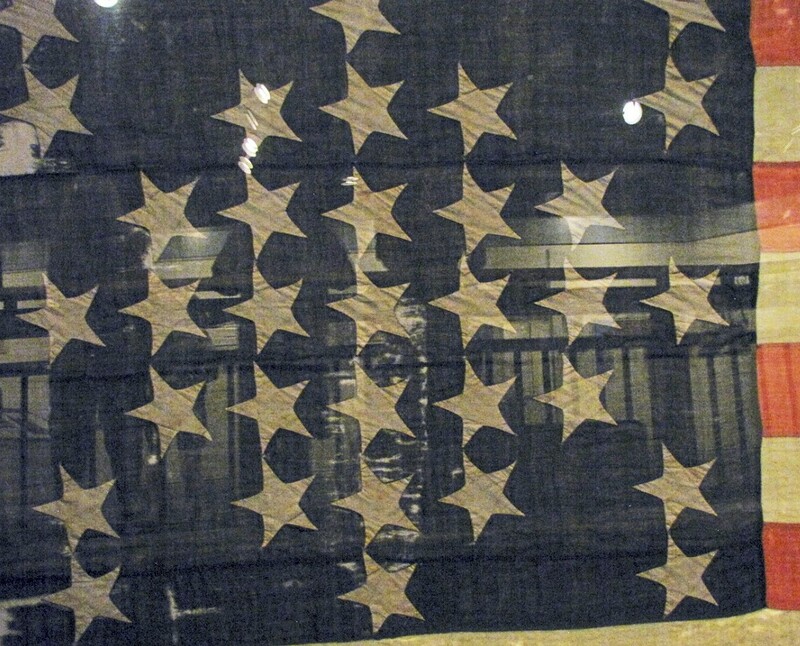 Today, the flag is displayed in the museum at Fort Sumter. You can visit the fort during regular operating hours, and admission is free. The fort is only accessible by boat, however. If you don’t have access to your own vessel, you can take a ferry from either Mt. Pleasant or Liberty Square for less than $20, round trip. Contact Spiritline Cruises for more information about the ferry. ~ by scareschs on February 11, 2013.